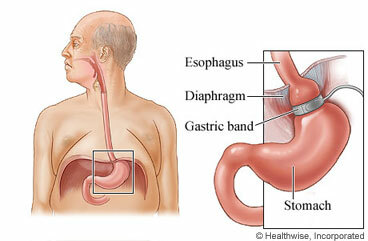 Laparoscopic gastric banding is surgery to help people lose weight. It makes the stomach smaller and limits how much food it can hold. This helps you eat less and feel full sooner. You will be asleep during the surgery. The doctor will make several small cuts in your belly. These cuts are called incisions. Then the doctor puts special tools and a camera through the incisions. Next, the doctor wraps a silicone band around the upper part of your stomach to make a small pouch. Then the incisions are closed with stitches. They will leave scars that fade with time. The small size of the stomach pouch means you will feel full after you eat a small amount of food. The doctor can adjust the size of the band by inflating or deflating it. This controls how quickly food goes from the new pouch into the lower part of the stomach. You probably will stay in the hospital for 1 or 2 days after the surgery. Most people can go back to work or their usual routine in about 2 to 4 weeks. Enter M964 in the search box to learn more about "Laparoscopic Gastric Banding: Before Your Surgery".